The Holy Sudarium is a cloth measuring approximately 84 x 53 cm. There is no image on this cloth. The only thing visible to the naked eye are some stains, although more is visible under the microscope. The remarkable thing about this cloth is that both tradition and scientific studies claim that the cloth was used to cover and clean the face of Jesus after the crucifixion. Such a cloth is known to have existed from the gospel of John, chapter 20, verses 6 and 7. These verses read as follows: “Simon Peter, following him, also came up, went into the tomb, saw the linen cloth lying on the ground, and also the cloth that had been over his head; this was not with the linen cloth but rolled up in a place by itself.” John clearly differentiates between this smaller face cloth, the Holy Sudarium, and the larger linen that had wrapped the body (the Shroud of Turin). The history of the Holy Sudarium is well documented, and much more straightforward than that of the Shroud. Most of the information comes from the twelfth century bishop of Oviedo, Pelagius (or Pelayo), whose historical works are the Book of the Testaments of Oviedo, and the Chronicon Regum Legionensium. According to this history, the Holy Sudarium was in Palestine until shortly before the year 614, when Jerusalem was attacked and conquered by Chosroes II, who was king of Persia from 590 to 628. It was taken away to avoid destruction in the invasion, first to Alexandria by the presbyter Philip, then across the north of Africa when Chosroes conquered Alexandria in 616. The Holy Sudarium entered Spain at Cartagena, along with people who were fleeing from the Persians. The bishop of Ecija, Fulgentius, welcomed the refugees and the relics, and surrendered the chest, or ark, to Leandro, bishop of Seville. He took it to Seville, where it spent some years. Saint Isidore was later bishop of Seville, and teacher of Saint Ildefonso, who was in turn appointed bishop of Toledo. When he left Seville to take up his post there, he took the chest with him. It stayed in Toledo until the year 718. It was then taken further north to avoid destruction at the hands of the Muslims, who conquered the majority of the Iberian Peninsula at the beginning of the eighth century. It was first kept in a cave that is now called Monsacro, ten kilometers from Oviedo. King Alfonso II had a special chapel built for the chest, called the “Cámara Santa”, later incorporated into the cathedral. The Holy Sudarium alone has revealed sufficient information to suggest that it was in contact with the face of Jesus after the crucifixion. However, the really fascinating evidence comes to light when this cloth is compared to the Shroud of Turin. The first and most obvious coincidence is that the blood on both cloths belongs to the same group, namely AB. The length of the nose through which the pleural oedema fluid came onto the sudarium has been calculated at eight centimeters, just over three inches. This is exactly the same length as the nose on the image of the Shroud. 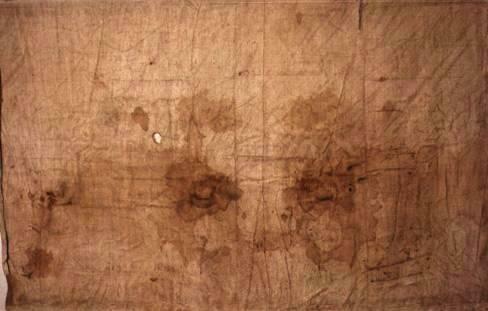 If the face of the image on the Shroud is placed over the stains on the Holy Sudarium, perhaps the most obvious coincidence is the exact fit of the stains with the beard on the face. As the sudarium was used to clean the man’s face, it appears that it was simply placed on the face to absorb all the blood, but not used in any kind of wiping movement. A small stain is also visible proceeding from the right hand side of the man’s mouth. This stain is hardly visible on the Shroud, but modern technology and photo enhancements have confirmed its presence. The thorn wounds on the nape of the neck also coincide perfectly with the bloodstains on the Shroud of Turin. The first studies on the Holy Sudarium, starting in 1965, are due to Monsignor Giulio Ricci who pointed out certain analogies with the Sudarium, which he had spent much time studying. The most recent examination of the Sudarium (the last international conference of studies on the Sudarium was held in Oviedo in April 2007), still being continued by the EDICES (Equipo de investigación del Centro español de Sindonología), initially established that the cloth had been placed over the face of a man already dead, folded, and tacked behind the head. A quadruple series of stains, mirror-like on both sides of the folded cloth, was found to consist of one part blood and six parts of edematous pulmonary fluid, a substance that accumulates in the lungs when death is caused by suffocation, such as occurs after crucifixion. The man whose blood is present on the Sudarium of Oviedo died therefore for the same causes as the man of the Shroud of Turin. Some stains overlie others in such a way as to make clear that the latter were already dry when the former occurred, and therefore the researchers deduced that the Sudarium was placed on the face of the deceased on at least two distinct occasions. Among the stains fingerprints also can be distinguished, located around the mouth and nose, left probably by those who were trying to stop a flow of blood from the nose after the cloth was wrapped around the head. In addition to stains of edematous fluid others of a different kind were recognized, including small dots of blood caused by small sharp objects, perhaps thorns. But the most remarkable coincidence is that the stains on the Sudarium showed geometric correspondence with those of the Shroud, and are also a little larger than them. The imprint of the nose, measured both on the Shroud and the Sudarium, was found to have the same length of eight centimeters. Surveys conducted in 1985 and again in 1993 showed that the blood of the Sudarium of Oviedo belongs to group AB, common in the Middle East but rare in Europe, the same group as the blood on the Shroud. The DNA survey on the other hand produced no outcome, the result was too fragmented and so unusable, and the carbon 14 test, which gave a 7th century AD dating was, however, considered unreliable by the scientists themselves because of the excessive pollution of the samples. The pollen found on the Sudarium, like those of the Shroud, examined in 1979 by the biologist Max Frei, suggest the Middle East and were found to be compatible with the flora of 1st century Palestine. In particular, Frei found traces of pollen from six different types of plants. Two were plants characteristic of Palestine: quercus calliprinos and tamarindus. The other pollens came from North Africa and Spain, unexpectedly confirming the itinerary of the Sudarium described by Bishop Pelagius. And finally again, the technique used in the processing of the flax, the material from which the object is made, also leads back to 1st century Palestine, again like the Shroud. All the scientific findings therefore seem to lead to the conclusion that the Sudarium of Oviedo and the Shroud of Turin were in contact with the same person. And this happened at close but separate moments; certainly the Sudarium before the Shroud, both because the larger stains suggest the blood was more fluid, and because on the Sudarium there is only blood but not the negative image which appears instead on the Shroud, where we know it was formed later than the bloodstains. Taking account of the results, it was hypothesized that the Sudarium of Oviedo may be the cloth that was used, according to Jewish custom, to cover the face of Jesus while being taken from the Cross to the tomb, but was removed from the face before this was covered with the Shroud; and that, precisely because it was soaked in blood, had to be left (according to Jewish burial rules) in the tomb. There is another relic that shows notable geometric correspondences with the Shroud of Turin as well as the Sudarium of Oviedo – the Veil of Veronica. My post of 25 July 2010 about my visit to Manoppello, Italy, titled Adventure Pilgrimage – The Veil of Veronica, has additional information about this holy relic. This entry was posted on December 19, 2010 by The Roving Adventurer. It was filed under Adventure and Travel Planning, Adventure Pilgrimages, Adventure Travels, What is Adventure and the Philosophy of Adventure .